Just the other day, I came across the following news stories: B.C. Truckers Association weighs in on how government should handle legal pot; Ontario government says it won’t put LCBO-run cannabis stores near schools; New Brunswick to sell pot from government stores, will check ID at door; Provinces still struggling with pot regulation ahead of legalization. Although most of these new stories focus on the consumer and retail aspect of cannabis, it just shows the trending nature of cannabis in Canada. More specifically, the legalization of marijuana — medicinally and recreationally — in this country is not only a hot-button topic that is here to stay, but also the spark that has led to what many believe will be a billion-dollar industry. However, at the root of all this interest in cannabis is the fact that: Someone has to grow it. Someone has to cultivate it. Someone has to harvest it. Someone has to sell it. And this is where Grow Opportunity comes into play. As the first publication dedicated to the production of cannabis in Canada, Grow Opportunity is focused on providing LPs with the information they need to build and expand their business, as well as plant the seeds for future success. 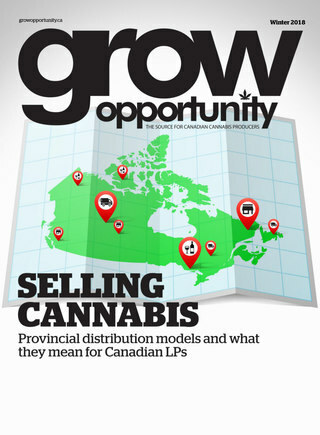 Grow Opportunity’s quarterly publication and digital and social platforms will act as a resource tool for industry investors, C-suite executives, managers and staff at LPs from coast to coast, as well as to those decision makers involved in the actual growing, harvesting and curing of cannabis. We are here to tell the LP story, and to help you grow as quickly and fruitfully as your very own crop. In preparing for the launch of our premier issue, I have attended several industry events over the past few months, including Lift Cannabis Expo in Toronto and the most recent Grow Up Conference in Niagara Falls, Ont. At these two events, I witnessed the passion people have for the cannabis industry, and the utmost desire that LPs have to produce the best quality product they can. At Grow Up, specifically, I really came to learn that there is much more to the cannabis world then what you see in the headlines. Or what the layperson believes Canada’s cannabis market is all about. The science pedigree, the agriculture expertise, the horticulture know-how that is in this industry is immense and is what really makes Canada’s LP community shine above all other cannabis producers around the world. And then there is the technology and business innovation that members of the industry are creating in order to stay ahead of the competition as we get closer to July 1, 2018 — the day Bill C-45, The Cannabis Act, becomes the law of the land. However, with all this being said, there is still so many unknowns that come with the legalization of marijuana: Who will sell it to consumers? What will the demand be? What will the LP landscape look like as more licences are issued by Health Canada under the Access to Cannabis for Medical Purposes Regulations (ACMPR)? In this issue, we have tried to answer some of these questions and provide you with just a sneak peak of the cannabis-related content we intend to produce. From our cover story on the growing export markets for LPs to our feature story on cultivation trends with several of Canada’s leading LP companies, our content will be personal, engaging, relevant and practical. I look forward to hearing your story ideas and learning how we can grow together in what sure is to be an interesting and rewarding journey.